It's unlikely that President Obama will ever shake his reputation among Republicans as a big spender. But a key fact counters that rap. As a share of the economy, spending on domestic and defense programs has been on the decline since 2010, and is on track to reach the lowest level in more than 50 years by 2023. 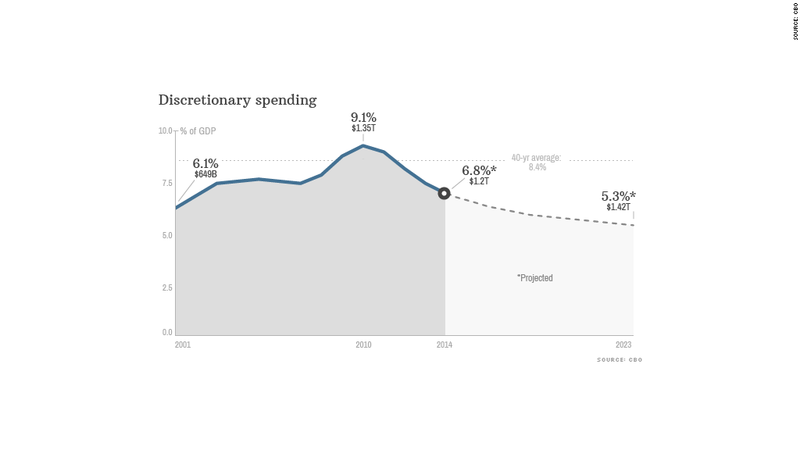 At its height in 2010, "discretionary spending" under Obama reached 9.1% of GDP. That was largely due to the stimulus law intended to dig the country out of a deep recession. But even at that high level, it wasn't that much higher than the 40-year average of 8.4% and was still below the 40-year peak of 10% reached in 1983. Today, levels are well below the long-term average. And the Congressional Budget Office projects that by 2023 discretionary spending will fall to 5.3% of GDP, the lowest since 1962. Of course, Obama can't take all the credit (or blame, depending on your perspective) for the downward trend in discretionary spending. A big driver of that trend is the Budget Control Act, which both parties agreed to in 2011 to avert a disaster over the debt ceiling. The Budget Control Act gave birth to the ill-conceived sequester -- the arbitrary budget cuts that primarily hit domestic and defense spending and put a restraint on discretionary spending levels for much of the next decade. Deficits, too, are falling. That's because of the lower discretionary spending but also various tax hikes on very high-income households and the recovering economy. Under Obama, the deficit peaked in 2009 at 9.8% of the overall size of the economy, but has fallen every year since. This year, the CBO projects it will come in at 3.4% of GDP and drop to 2.1% by 2015. Then deficits will starting to climb again, reaching 3.5% by 2023. And in the decade after, they will get bigger still. That's partly due to an expected rise in interest rates -- and hence higher interest payments on the country's accumulated debt. But two other big reasons: Obama and lawmakers have yet to tackle the growth in spending on entitlements and to figure out how to overhaul the tax code.